Back in April we welcomed launch of the Golden Goose Awards , an annual prize awarded to honor federally funded research “whose work may once have been viewed as unusual, odd, or obscure, but has produced important discoveries benefiting society in significant ways.”. The Golden Goose award was developed in response to attacks on basic research by politicians who fail to appreciate the value of basic research, and it is not difficult to imagine that a research project begun back in the 1980’s which sought to determine the role of a gene named “hedgehog” during embryonic development in fruit flies would have been greeted with derision by the usual suspects . D. melanogaster, an organism whose small size belies its huge contribution to medical science. Image courtesy of André Karwath. 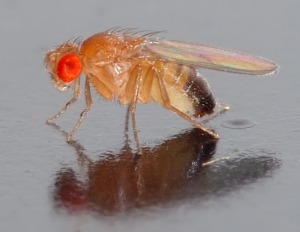 I encourage you to read the full CRUK Science Update Blog post “High-impact science: Hedgehogs, flies and skin cancer – the story of vismodegib” , it’s an excellent example of how research on flies, rodents and a range of other organisms combined with studies of cancer genetics in humans to enabled the development of an innovative therapy.